I found this draft on my desk. Littlepeach#2 had left it there after using my printer to produce a final paper for school. The end product did not have the cute little doodles so I am keeping the draft. I think it is just so sweet, I had to brag share. Talented just like her Mommy! What a wonderful poem! I’d keep the doodles, too. That will warm your heart for years to come. How very very sweet. I still have some of my sons poems he wrote as an eight year old and is now 35. I have scanned them then put the originals in a box of his baby pictures. It is a wonderful memory box. What a lovely poem- So sweet and creative. Something to keep for the scrap books! How Dear! How Lucky to find it,it will be fun to give it to her children! Thanks for sharing that precious poem. I love children’s creative works. That is definitely a keeper! You could embroider her poem and doodles onto a Christmas present for her! Love that idea about embroidering her poem and doodles,if she wouldn’t mind. It’s great that you posted this-reminds me how positive and innocent kids can be. You must be very proud of her! 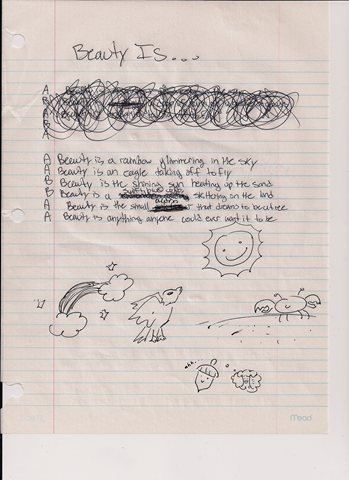 what a sweet poem….and those doodles are great…that acorn is the BEST! Love the poem and the doodles! She is very sweet and creative – a real chip off the old peach, I think. Well, not that you are old or anything – but you know what I mean!! Quite a keeper!! That is sweet as can be.